If you love the old sci-fi black and white cliff hangar serials from the 30s and 40s, and space combat skirmish games with miniature models, then War Rocket just might interest you. 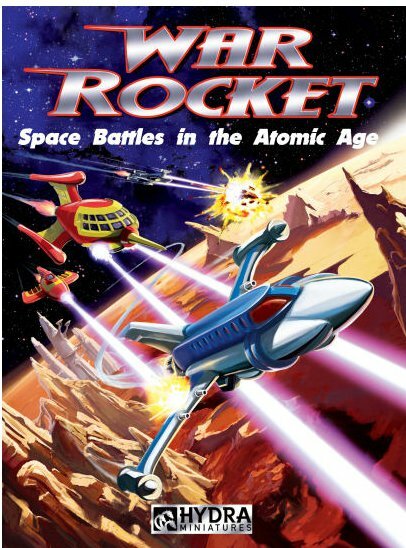 War Rocket is a space combat game from Hydra Minatures, which is meant to capture the look and feel of the old B&W serials like Buck Rogers and Flash Gordon. Some of you may be too young to know what I'm talking about, but you might also remember the episodes of Star Trek Voyager where Tom Paris and Harry Kim would go to the holodeck and take part in episodes of Captain Proton together? Those episodes also paid homage to the classic B&W sci-fi cliff hangar serials of the 30s and 40s, and captured the look and feel of the classic sci-fi serials in exacting detail, right down to the campy comments and low budget props. All that you need to play War Rocket is a measuring device in inches, a 10-sided die (D10), some War Rocket models, and a kitchen or dinning room table with a black cloth, or a gaming mat thrown on top. Tokens or markers of some kind will be needed as well, like glass beads, or even some extra dice can be used to track how many Hit Tokens are used. Different colored dice could even be used to represent Stun and Delay Action tokens as well. War Rocket features four unique Fleets/Races. The Galacteer's are the humans. The Imperial fleet are the badguy humanoids, I think of them as Ming the Merciless's fleet from the planet Mongo in Flash Gordon. The Valkeeri is another alien race, and the Zenithian's are definitely aliens, complete with flying saucers. Each fleet has a really unique and distinguishable ship design. All ships in War Rocket are called Rockets too. The Galacteers Rockets resemble airplanes, as they have a more aviation rooted design. The Imperials Rockets look very much like the ships from the planet Mongo depicted in Flash Gordon. The Valkeeri are more bulbous in design, fat, round, almost teardrop shaped Rockets, but very sci-fi just the same. Lastly the Zenithians are flying saucer shaped Rockets. What really separates them all the most is that each Fleet has a distinct way that they're required to move. These are called Flying, Thruster, Saucer and Pulse Movement styles. Flying is what the Galacteer's use. Thruster movement is limited to the Imperial Fleet. Saucer Movement is the method that the Zenithian's employ and Pulse Movement is limited to the Valkeeri Fleet. Further breaking them down... Flying Movement is explained as Rotation followed by at least 2-inches of movement before another rotation is allowed. It's 1 speed point to move 1-inch, and it costs 2 speed points to make any rotations during the movement phase. Thruster Movement is similar, but by design it's clear that the Imperials can't cut turns as tight, because they're movement is limited to Rotation followed by at least 4-inches of movement before another rotation is allowed. Both Flying and Thruster movement types can begin with a rotation too. The Saucer Movement is quite unique too. They can change direction as often as they like, but no rotations are allowed at all while moving. Once the movement is complete, then they may rotate as many times as they have movement points to spend on rotation. This simulates that almost unpredictable zig-zag movement of flying saucers in the old classic sci-fi movies, and how they would spin around in circles in one spot. Lastly the Pulse Movement allows for just one rotation per turn, but it can be done at the beginning, end or part-way through movement, and you may rotate as far as your speed points allow. The game uses flying hex bases so this helps to keep the movement somewhat uniform too, and the rulebook by default doesn't use a hex map/hex-gaming mat, but rules are also provided to use a hex gaming mat to speed things up. I'd have to agree that hex play does look like the best route to take, as hex-less play is a lot of fun too, and the rules aren't terribly complicated either way, but there's something to be said about having the lines drawn out in front of you, especially when it comes to movement that needs to be quite exact. I'd imagine that the hex-play would help to avoid any confusion, or rules-lawyering later more than anything. The Sequence of play is as follows. There's an Order Phase, Delayed Action Phase, Movement Phase, Attack Phase, Damage Phase, Recovery Phase and Special Action/Delay Token Phase. That sounds like a lot, but it's not as involved as it looks on virtual paper. During the Order Phase both sides determine which ships will move, in what order. The slowest models always move first, and the fastest models always move last. If you both have the slowest or fastest models, you then roll off to determine the order. The order which you move will also be the order in which both sides will handle combat as well. The Delayed Action Phase is next, but on the first turn of the game there's nothing to do. In this phase any models with a Delayed Action token may move and fight before all of the other models get to activate. After a model with a Delayed Action token activates, then it's done for the rest of the turn. The Movement Phase is self explanatory, you simply move all of the ships in the order that both sides determined in the Order Phase, with all Fleets using their own unique movement style, based on how many speed points that they have to spend. Now there's a few different types of objects modeled in the game that can interact with movement. There's Planetoids, Asteroid Fields, Nebulas, Planets & Moons and even a Worm Hole. A Planetoid blocks line of sight and movement. An Asteroid Field stops movement once the base if halfway in, and the effects of it are felt as soon as base contact is made. Movement is reduced by half, and you have a 10% chance of being Stunned which is rolled for during the Order Phase as long as you're in an Asteroid Field. A Nebula also reduces movement to half, but also reduces all weapon ranges to 2-inches, and only rockets inside the Nebula can attack others inside the Nebula, but nothing can shoot into the Nebula from the outside and vice versa. Bump into a Worm Hole via base contact and you're immediately swept away, randomly transported to another Worm Hole. A Worm Hole also blocks LOS. Planets & Moons also block LOS and Movement, but they can be landed on as well. Next up is the Attack Phase. In this phase both players place Hit Tokens on all of the models that they have established that can be targets, which have to be within their weapon's firing arc and LOS. Since in a space-like environment ships can swoop in at most any angle up, down, sideways, etc, other Rockets don't block LOS. Checking range and LOS is also very easy, because you check from flying base post to flying base post. It's that simple. Each Rocket has two stats Firepower and Defense, and these are pretty much the only stats you'll reference the most during the game. Beyond the specific Fleets, each of the Rockets within each Fleet are also further separated into four classes I, II, III and IV. The majority if the Class I Rockets feature Firepower 1 weapons, with a Defense value of 1, with the exception of the Imperial Fleet Class 1 rocket, it has a Defense value of 2. The value for Firepower dictates how many hit tokens that weapon can produce, essentially how many shots you can fire. After both sides have placed Hit Tokens on all of the target Rockets, then you can begin to workout Damage. Lets say three of my Class I Rocketeer Fleet Rockets were within range and LOS of a single Class I Zenithian Rocket saucer. I placed 3X Hit Tokens on the single Zenithian, since it was the only Rocket in range of my Rockets. Now I reference the Damage Chart. On it there's a listing for Defense 1-4 up the left side, and numbers ranging from 1-16 along the top of the chart. For example, I need to cross reference now 3 Hit Tokens versus a Defense value of 1. The value shown on the chart is 3/5, which means on a single D10 if I roll a 3-4 the target is Stunned, but if I were to roll a 5 or higher I could Destroy the Class I Zenithian Rocket altogether. If I had only placed a single Hit Token on that Rocket, then I'd have needed a roll of 7+ to Stun, and a 10+ to Destroy (7/10 on the chart). The more Hit Tokens you can put on a Rocket, the better chance you have of rolling for a successful Stun or Destroyed result. You also work out damage with a single roll, not multiple roles for each Hit Token. Say we were playing with more than 2-players. If I and a 3rd player ganged up on that same Zenithian Rocket saucer, and he contributed 4 Hit Tokens. The rules state that the person who contributed the most Hit Tokens is the one who would make the Damage roll, which would be player 3. In that example now we need to reference the Damage chart for 7 Hit Tokens versus a Defense of 1, adding his 4 Hit Tokens to the 3x I contributed. On the Damage chart that value is listed as A/2, which means Automatic Stun, and a Destroyed result occurs on a roll of 2+ on a single D10 die. The first number is always what you need to Stun, and the second value after the / is the result needed to Destroy. Stunning immobilizes a Rocket model for the rest of the turn, and you place a Stun Token on the model at that point. By the time the Recovery Phase for the next turn makes it around, then you can remove the Stun Token. A Stunned Rocket retains its Defense value, but can do nothing more until that next Recovery Phase. Additionally if a 2nd Stun result occurs while a Rocket is already Stunned, then it's automatically Destroyed. As you can see combat is very simple, and there's not a lot of bookkeeping to worry about. The higher class the Rocket is, the more weapons and the higher number of different arcs you may have on a single Rocket too. Keeping track of firing separate weapons, each from the proper firing arcs is about as complex as it can get. Creating a Fleet to play before a game is quite simple too. Class I Rockets are 10 points, Class II, 15 points, Class III 25 points and Class IV Rockets are 30 points. So you can construct your force based on those point costs. Pages 42-49 list a number of scenarios provided to play War Rocket as well. In the scenarios is where they actually begin to define the size of the playing field too. The Scenarios provided include Satellite Destruction, Shoot Out, Asteroid Action, Mining War, Daring Rescue, Assault on the Mother Ship, Convoy Breakthrough, Evacuation, and Lightning Raid. The names alone can give you an idea of how varied and unique the scenarios are, giving players a lot of fun situations to play out with their Rockets. The Daring Rescue scenario sounds like something ripped right out of the end of the Flash Gordon movie from 1980, as you have to fly past batteries firing at you, and then to make it to a landing pad to rescue the princess. This scenario uses some of the Advanced Rules. Mining War is a scenario in which Rockets must dock with an Asteroid to mine it for one turn, and the first side to successfully fly five loads off the board wins. Shoot Out is also your standard last man standing scenario, using the very basic rules. So there's very simple, and quite advanced scenarios provided both. Above pretty much covers the basic rules. I'd suggest running through those a number of times first, before diving into the Advanced Rules. The Advanced Rules adds Ramming, Boarding, Landing, Docking, Shooting to Stun and Mine Fields. Next there's a complete section on Rocket Customization, allowing you to not only create your own fleet, but to add customized Crews as well. Essentially the Crews are nothing more than special abilities or bonuses if this were most any other war/skirmish game. For instance Atomic Engineer adds +3 points to your build cost for your ship, and it grants the bonus “Increase speed by 2-inches”. Many other Crew options are available to help with boarding actions like Rocket Troops and Space Marines, or Weapons Master cost +5 points per model, and grants an extra 2-inches to all weapon ranges, and you can add a +1 Firepower to any single weapon during the attack phase per turn. There's quite a few Equipment Customization options presented too, like Bow Ram which costs +1 point per model to add it to a Rocket, and grants an extra Hit Token when using that Rocket to Ram. Force Fields, Grappling Hooks, extra Turret Weapons, even an Escape Pod is listed as an option, just to name a few. I really don't understand the need of the List of Defects, but it allows you to hinder your Rocket with a defect, at the cost of minus build points. For instance if you wanted to gain back 3 points of your Construction Cost, you could opt for the Low Tech Weapons Defect, which reduces all of your weapon ranges by 2-inches. That defect frees up 3x points to now spend elsewhere I guess. Pages 58-60 includes a section called Squadrons of the Reknown, which details some fictional pre-assembled squadrons that you can build and play in War Rocket. Next pages 61-62 is called Space Stations, Mother Ships, Guns and Freighters, which supplies the rules for all of the above. Pages 63-65 covers Hex play rules, which will help you convert the existing movement and ranges for hex-based map/mat play. The remaining pages are considered the Appendix, with all of the reference sheets, rule summaries, fleet reference sheets and a six page Modeling and Painting guide in full color. For as simple as the rules are, tactically it can still be a challenging game with a decent replay value. It's balanced quite logically too, because the smaller yet faster ships only have forward arc firing weapons, so they really need to get into position to get off a shot. While the bigger yet slower moving ships might seem like they're at a disadvantage, because they're slower and bigger, but they have a higher Defense value, and they usually have more weapons, most of which aren't limited to just firing dead ahead. The models are also absolutely outstanding. They capture the look and feel of retro sci-fi like no other. It's all in the little details too, like the Zenithians for instance. Their ships are saucers, but not the dull and bland saucers with no detail from 50s sci-fi, but more like something from Mars Attacks. You almost expect to see Marvin the Martian step out with his X35 Space Modulator in-hand to threaten taking over the world. I'm not at all a big fan of saucers either, but these ones have character. While the game is clearly designed for use with the amazing official War Rocket models that Hydra Miniatures produces, I can even see the War Rocket rulebook being used as a generic space combat ruleset to allow you to play with other models as well. I've seen some of the other options out there in the way of models, and I see no reason why you couldn't use the rules in place in War Rocket, and the templates they have to allow you to play some BattleStar Galactica, Bablylon 5, Star Trek or even Star Wars battles with just the same. There's a section on how to customize your own ships, so the tools are there to use if needed. Want to play Star Wars space combat on the cheap? The Wizkids PocketModel plastic-card models are dirt cheap anymore, and I can see now how easily it would be to play War Rocket with those models, as they come on hex bases already to boot! I can see the Imperial Tie Fighters using the Imperial Thruster movement style and Class I templates, and the Rebel X-Wings utilizing the Flying movement style of the Galacteers and Class I templates with no modification at all. Class III and IV models could be the Millenium Falcon, Frigates and Star Destroyer models with very little modification as well. Not to downplay War Rocket either, because it's a great game with really nice looking fun models, which capture the look and feel of retro sci-fi so well. But as my example shows it's such an easy to learn and fun to play ruleset, that it also could end up being one of the best rulesystems for generic space combat in general just the same. 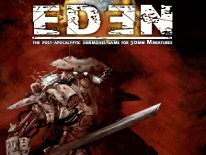 At just $25 for the rulebook, it's probably the best and most affordable set of space combat rules released in 2010. As for the official models they aren't all that expensive either. You can get 3x of the smallest Class I models for $11, and a single Class II rocket is priced at $7. They sell some sets of Starter armies which includes 9x of the Class I models and 3x Class II models for $48 which is also cheaper than buying them all separately. Class III and IV rockets sell for $12 and $16 each respectively, and are much larger than the Class II and I models, so overall they're reasonably priced models. Actually as you move up to the bigger models they jump up to resin models with metal parts, so you really are getting a decent deal, as resin is almost always able to retain more detail than metal. I think the starter sets are probably the best bet, because you can get into some fun and compelling games with just a few of the Class I and II models per side anyway. My only complaint is that the posts from the flying hex bases that each model comes with requires that you snip the tip of the post off, or the models won't fit on the bases. Also even after snipping, the fit on some models still isn't very snug, so you'll need to add some greenstuff, or blue-tac to keep the models from teetering all over the place. That aside the models do look great, and they're priced to sell. The game itself really is worth giving a shot, because the rulebook is a self contained complete sci-fi space/combat gaming system. Everything you need to get started is pretty much there, outside of a ruler/hex map, models, a D10 and some counters, which are all the items most gamers have already. Even if the models are out of your price range, the rulebook alone could be easily adapted to play a number of other sci-fi scenarios with. The rules to create custom ships alone gives it a replay value that few other games can match to boot. Since there are rules in place for landing and boarding, I also see this as being a nice ruleset to mix in with other 25-30mm scale ground-based skirmish games. I can see how War Rocket could blend in perfectly with AE Bounty, because you could use it for the 28mm scale on-board or on-land gaming side of things, and use War Rocket's rules for the space combat side of things. I think they'd compliment each other very well, with very little modification of the rules of either system. There's certainly more in-depth rulesets out there, which take into account complex 3D movement, more in-depth damage modeling, and some even require larger fleet scale movement and tactics, but I doubt you can learn the basics of any of those games in the time it takes to learn, play and already be hooked on your first game of War Rocket.